Start with our bug tracking template and customize it for your team’s needs. Import an existing spreadsheet where you currently track bugs. If you want to track bugs around specific features, products, or pages create a project for each so bugs are submitted to the right place. If you’re a free user, prefer to build your own bug project from scratch, or want general best practices for Asana projects get started here. If you used a template, you’ll already see a few custom fields, but if you want to change them or add more, just click the blue Add Custom Fields button at the top of your project. Custom fields help you track key details on each task, and then filter and sort your project—like spreadsheet columns. Fields like source and priority can help your team make sense of feedback and ensure fixes get actioned. To quickly gauge high priority bugs sort your project by custom fields so you can assign out to teammates to fix. Bug reporting is vital to fix issues and learn more about customer needs—but that isn’t possible if you track it in different ways or places. 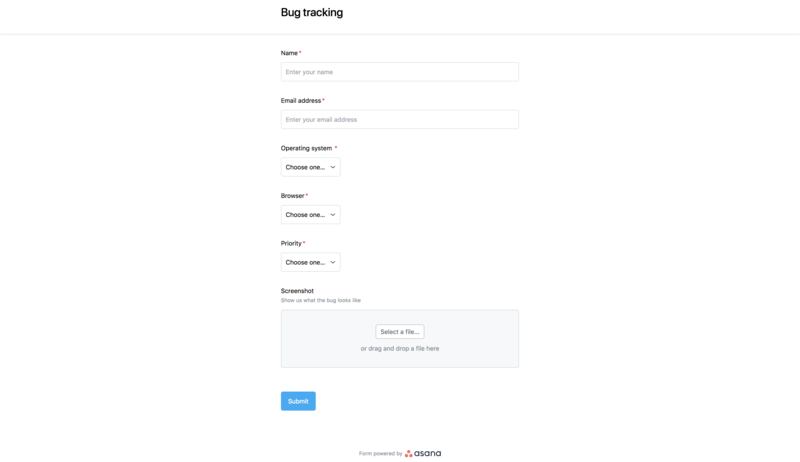 Instead, create a bug tracking form that’s directly connected to your project. The form ensures bugs are captured uniformly so your team has all the details to action them. Follow these instructions to create a form. Forms can be submitted by anyone—even if they don’t use Asana—by sharing the form link with them. Your customer-facing teams won’t have to rely on email and customers will feel heard, without your team managing an unruly inbox. If a screenshot of the bug is included, teams can use image proofing to make comments directly on the image so issues are reported in context. Comments made in proofing turn into subtasks that can also be assigned out. If you get a lot of bugs reported via chat or email, you can always send the link to your form, but you also have the option of using integrations to quickly turn them into actionable tasks. 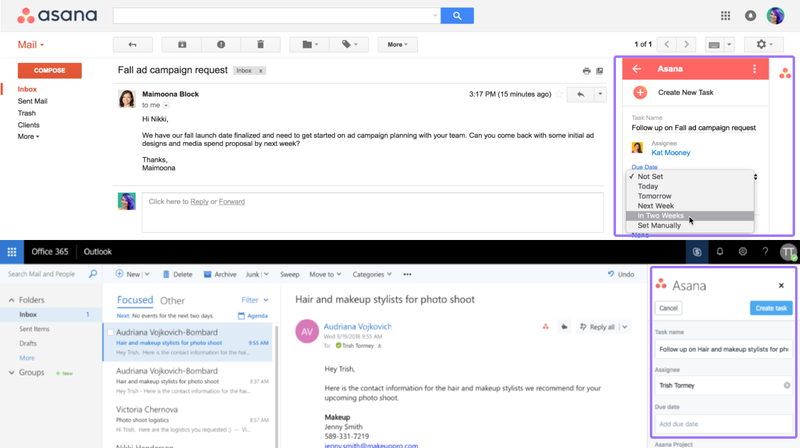 For email, use the Asana for Gmail, Outlook, or other email client add-ons. For chat, try the Asana for Slack integration. Though custom fields and forms help you start with an organized project, assigning a Project Owner responsible for evaluating incoming bugs on a regular basis keeps it organized. You can assign them a recurring task to triage the bugs. During the triage, if they notice that the same bug has been reported already, they can merge the tasks to eliminate duplicate tracking. Not all feedback needs immediate action, but if it does the Project Owner can assign the task out and give it a due date. The task will already have all the necessary context for the assignee, and the expectations will be clear. This saves teams tons of time from going back and forth about what’s happening—and customers are happier to see that issues are resolved faster.